Judgement Day had arrived. 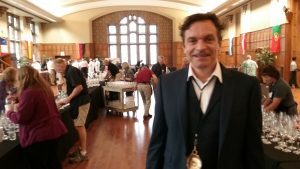 On 24th May, with fifty wine judges in white lab coats poised to start blind tasting almost 2,000 wines, the 26th annual INDY International Wine Competition opened with remarks from the mercurially entertaining Christian Butzke. 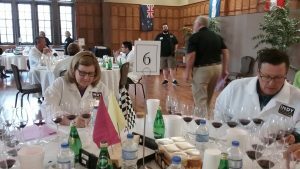 The Purdue University Enology professor and the wine championship’s chief judge offered guidance to the judges. He said it was important that this year’s results were relevant to the future of wine, the millennials, a generation known for their lack of wine snobbery and tendency to embrace sweet as well as dry wines. It would be hard to find a competition that shines a spotlight on more wines relevant to millennials. 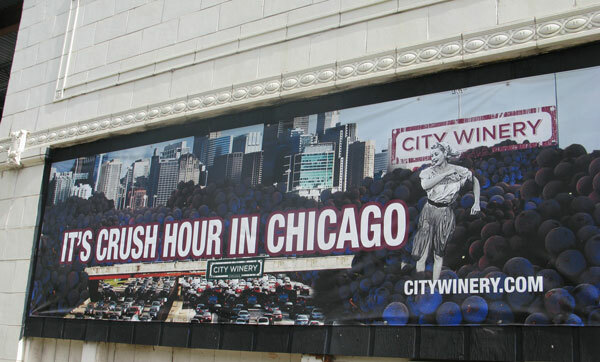 INDY is also a showcase for great hybrid and vinifera wines from across the USA and the world. You’ll find classy Cabernets from Kentucky, delicious, often sweet, hybrid whites like Traminette and La Crescent from all over the Midwest, and unusual wines flavored with peanuts or lime. But there are also more conventional offerings like Italian Proseccos, Merlots from Washington State, California Chardonnays and even Sauvignon blancs from New Zealand. 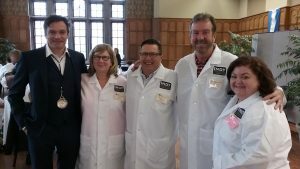 Midwest Wine Press was a lucky member of a judging table captained by the sagacious Kim Doty from Indiana’s French Lick Wine & Spirits, the genial Allen Dossey, owner and winemaker from Kentucky’s Purple Toad Winery and the fun Andrew Meggit, winemaker for Missouri’s St. James Winery. As judging got underway, winemakers Allen and Andrew discussed cross filters. The St. James winemaker assured Allen that this form of filtering doesn’t strip flavor and is very good for fruit wines. There were more helpful winemaking hints to follow. blends, berry wines (with a particularly pungent raspberry sample) and hybrid roses. The latter included a Chambourcin blush that was the lightest colored wine I’d ever seen and a white Cynthiana with a lovely aroma of honeysuckle. Between 9am and about midday we tasted seven flights, most with about ten wines. Christian: So what are you doing now? Writing for The New York Times or The Washington Post? MWP: Unfortunately no, just the trusty MWP, some other freelance writing gigs and a bit of public radio. Christian: Public Radio? I have an idea for a radio show! Like two guys talking about cars, but wine and you call in with donations. We could make a fortune! It would be a public radio-Breitbart News combination! Christian Butzke, Purdue enologist and chief judge of INDY 2017. Back at our wine judging table my colleagues were also in a joking mood. French Lick’s Kim told a story about a customer who came in and asked if there were any Nigerian wines. It turned out they were after wine made from Niagara grapes! 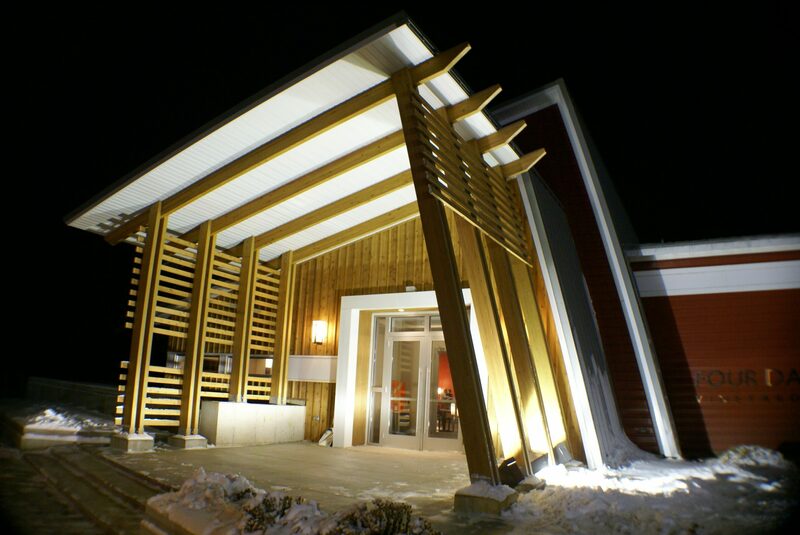 All the wines we tasted — including the Niagaras – were very enjoyable. Perhaps the best flight came on day two, the final day of judging: an exceptional flight of 8 Cabernet franc wines. Number 1727 had lovely dry cherry aromas. 1600 started with an intriguing charcoal/earth smell. 396 was Cabernet in style with robust plummy fruit qualities. Despite this stiff competition, we later found out that Kim, our table’s captain, actually made a Cabernet franc that won best of class at INDY this year. Congratulations! We also thought we’d found the millennial sweet wine par excellence. 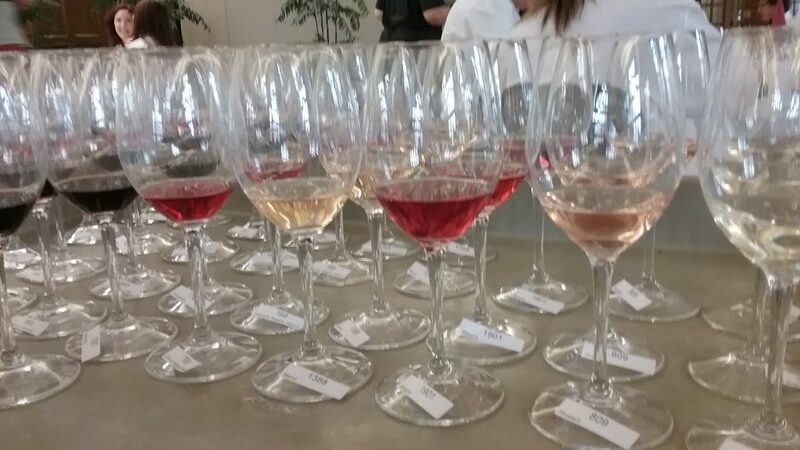 During a sparkling wine taste off between a Valvin muscat and a Concord, the Concord’s bubble gum aromas and particularly moussey bubbles struck us as a millennial winner. But there were plenty of other wines that might please sweet drinkers including a sweet Chardonnay on our very first flight and a little later, a sweet Merlot. Sometimes the flavors were just unusual. A flight from naturally flavored bottles offered a powerful lime candy wine and also a very peanutty peanut wine. There was a syrupy Tempranillo coffee wine that had some members of our table moaning for more. The winemaking tips continued. After a discussion about a winemaker who made bad wine but insisted, despite a lack of customers and diplomatic words from colleagues, that his wine was good, Allan offered some good advice for any winemaker starting out: ‘You’ve got to be better, cheaper or different to other wines. But if you’re different, you have to have a big enough following.” It wasn’t just a rant. When the judging was over, Allan offered his own Cabernet aged in old bourbon barrels for tastes. I couldn’t actually detect much impact from the bourbon but for its gorgeous fruit and strong varietal character Allan’s red was the best Cabernet I’d tasted over the last couple of days. A little later we learned that Allan won the INDY Winemaker of the Year award. It was clearly well deserved! The full list of 2017 winners and results can be found on the Indy International Wine Competition website.